When I got my first Cricut, the whole idea of removable blades mystified me a bit. In fact, I didn’t touch that fine point blade for the first couple of weeks. 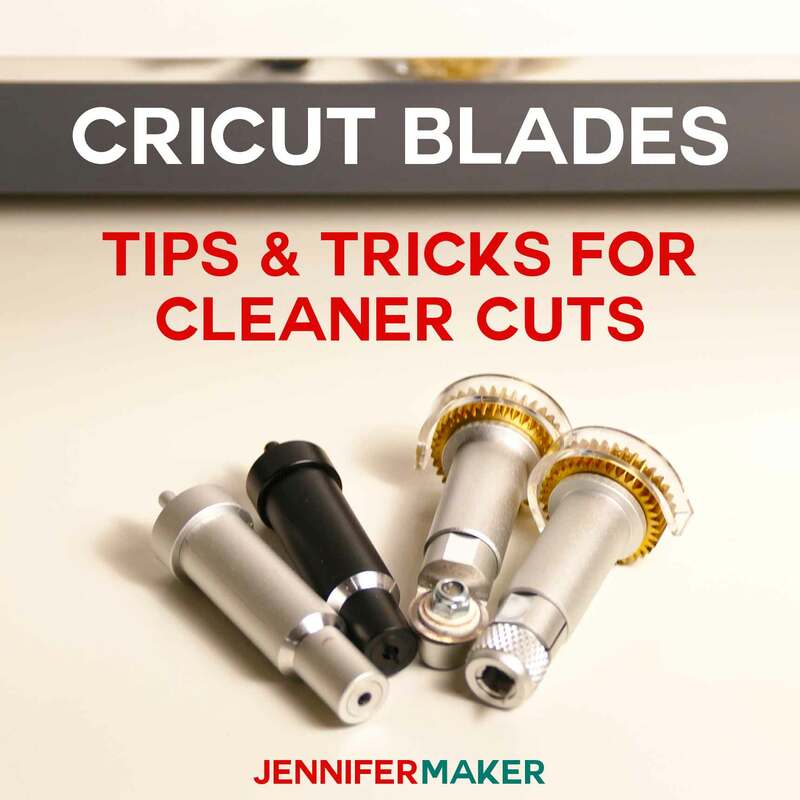 Then I noticed my cuts weren’t as clean as before, and I thought, “Oh, I must need a new blade.” This set me off on a quest to learn about Cricut blades — how to find them, install them, change them, and — of course — use them properly. For the first 6 months of my Cricut’s life, I changed my blade regularly. Whenever the blade seemed dull, off I went to the store to get a new one. But at some point I got tired of buying new blades and instead starting looking into how to extend my Cricut blades’ lives. Since then, with what I learned, I haven’t bought a new Cricut fine point blade in over a year! Now I am a pro at making the most of my Cricut blades, knowing which blades works best for which projects, and getting the best results from each blade. I want you to be a pro, too, so I’ve put ALL my tips and tricks here for you! I recommend you print this out and keep it next to your Cricut so you can check it every time you have a Cricut question! 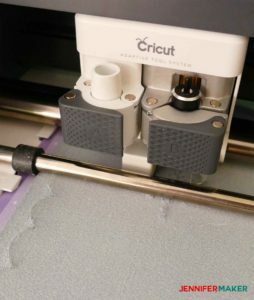 The Cricut Blades: What’s the Big Difference? Which Blade Do I Use For This Project? The Premium Fine-Point Blade is your standard, basic blade. It’s what most of us start with, and many folks only ever use this blade. It’s used for cardstock and vinyl mostly. I use this blade for 90% of my Cricut cutting projects. If you like to cut fabric on your Explore, the Bonded Fabric Blade is the blade for you. This blade will stay sharper longer when cutting fabric. While it fits both the Explore and Maker, it’s really intended for the Explore as the Maker has other blade options for fabric, like the rotary blade. Fabric cutters will want to use the Rotary Blade in their Maker. This blade has a tiny rotary wheel that can cut amazingly intricate designs. You can also use this blade for crepe paper with great success! Basically, the rotary blade is great for any material that would snag on a regular blade. Got something really thick to cut? The Knife Blade is your solution! This is like a miniature and very sharp Xacto knife and it can really get in there to cut the tough stuff. I’ve used my knife blade to cut wood and leather. The latest addition to the blade family doesn’t actually cut — instead, it scores. The Cricut Scoring Wheel looks like the rotary blade, but it won’t actually cut through your material. It comes with two tips: the single scoring tip and the double scoring tip. Use the single scoring tip for light materials like cardstock. Use the double scoring tip for harder to fold materials like cardboard. Now that you know each of the blades, let’s look at which blade you should use for which project. Below is a chart that shows you blades and materials. Whenever I have a project here on the blog that used a particular blade, I’ve linked it so you can see REAL results! 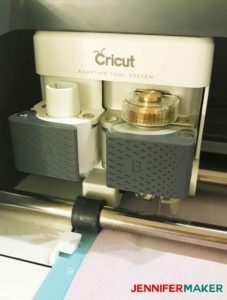 First, it’s important to understand that Cricut blades really come in two parts — the blade itself and the blade housing. You need BOTH to install and cut with them on your Cricut. All new Cricuts come with a Fine Point Blade and Blade Housing, but if you go to the store to get a replacement blade, you only need the replacement blade, not a whole new blade housing (unless you lost yours or something like that). Buy a Premium Fine-Point Blade (for a fine point blade housing) or a Deep-Point Blade (for a deep-point blade housing). Note that these two blades have different housings — they are not interchangeable. Open the clamp and remove the blade housing. Push the plunger on the top of the blade housing and gently pull out the blade from the bottom. Be careful—it’s sharp! Set it aside. Remove the little plastic cover from the new blade. Put the shaft of the new blade into the blade housing. There’s a magnet in the blade housing that will hold the new blade in place. Replace the blade housing in the machine. 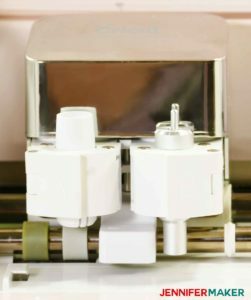 (See Changing Your Cricut Blade Housings below). Put the little plastic cover you removed from the new blade onto the tip of your old blade to keep it from hurting you or anyone else. Buy a Rotary Blade Kit. Remove the rotary blade housing from your Maker. Open your Rotary Blade Kit, remove the protective plastic cover, and slip it over your existing rotary blade with the large opening over the housing screw. Make sure you feel the protective cover click into place. Use the screw driver provided in your kit to remove the screw from the housing. Keep the blade within the protective cover as you do this. Remove the new rotary blade, conveniently placed in a new protective cover, from the Rotary Blade Kit package. Place the new rotary blade over your housing. 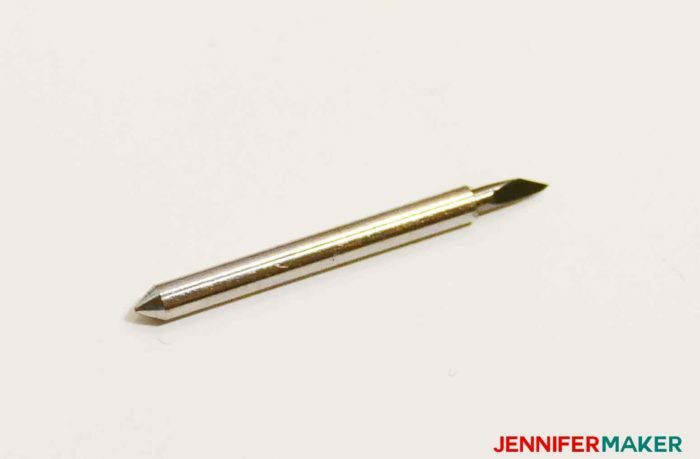 Replace the screw with the screwdriver — be careful not to over tighten it. 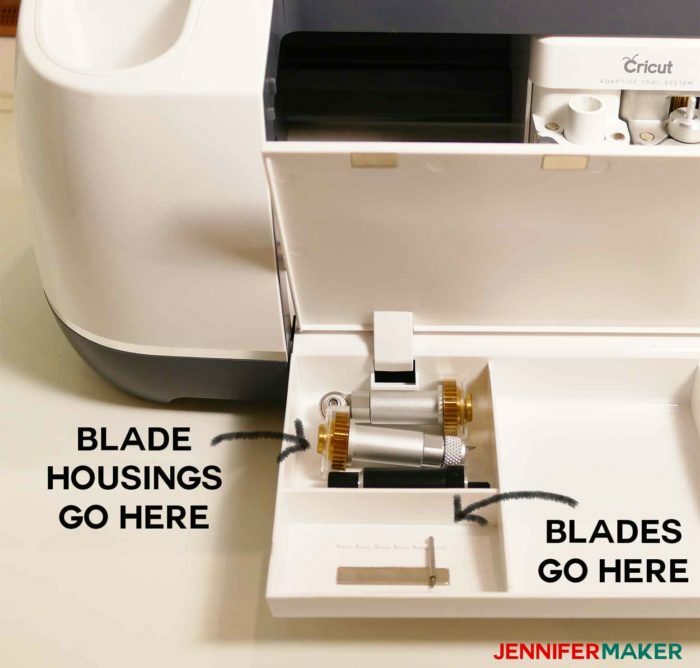 Remove protective plastic covering carefully (remember, that rotary blade is still sharp) and replace the rotary blade in your Cricut (see Changing Your Cricut Blade Housings below). Put the old blade (with the protective cover still on it) back into the packaging before you store or discard it. One of the things I love about the Cricut is how easy it is to use. That installing and changing blades is no exception to this! 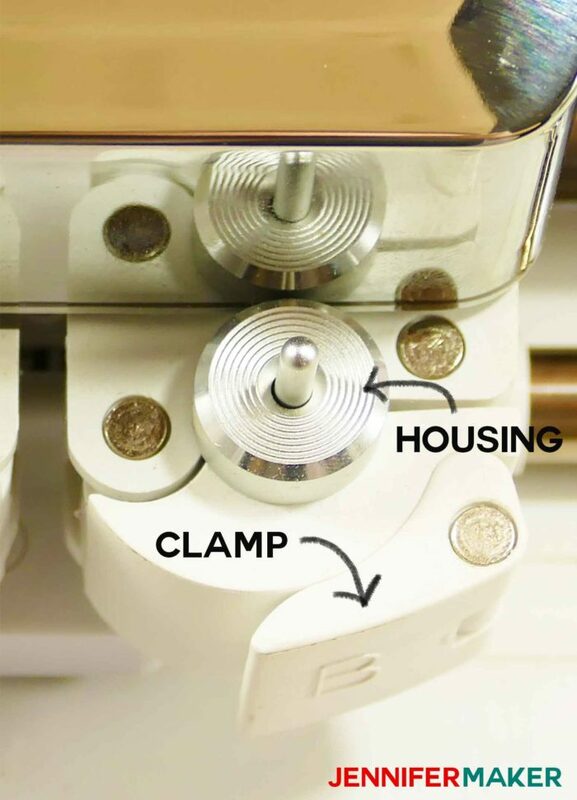 To change the Fine Point and Deep Point Blades, you simply open the clamp (clamp B if you have two clamps), pull up and remove the blade housing currently in your machine, drop in a new blade housing, and close the clamp. Voila! To change the Knife Blade, Rotary Blade, or Scoring Wheel on the Cricut Maker, you just need to make sure the gear on the blade housing is facing toward (and fitting into) the gear on the Cricut. Open clamp B, remove whatever blade housing is there, position the new blade housing so it fits in the gear, and close the clamp. 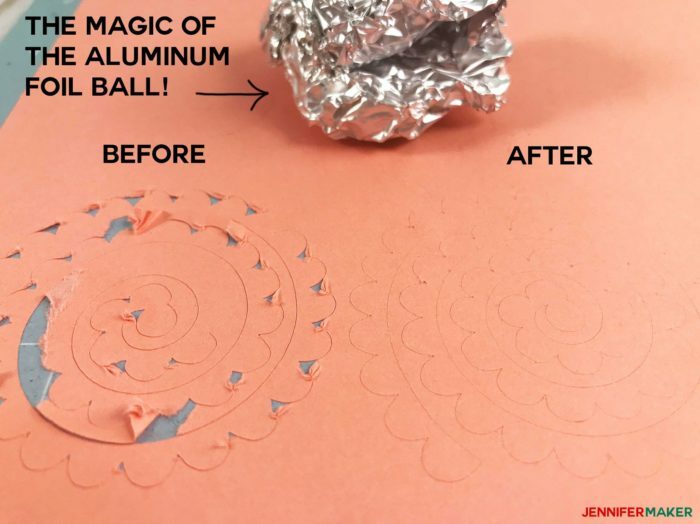 Ball up a sheet of aluminum foil, remove the blade housing from the Cricut, depress the plunger, and stick the blade into the aluminum foil ball over and over. I do poke the point in about 50 times. This helps to remove any bits of paper or vinyl that might be stuck to the blade and also seems to sharpen it. This technique works for the Fine-Point and Deep-Point Blades. Spread a piece of aluminum foil on your cutting mat and cut a simple design in it. It will help sharpen your blade a bit and doesn’t require that you remove your housing. This technique works for all blades. Another way to keep your blades sharper is to use a different blade to cut paper than the blade you use to cut vinyl—it will extend the life of the blade and make for sharper cuts. Color code your blades by painting the tip of the plastic blade cover with some acrylic paint—white for paper, black for vinyl, etc. 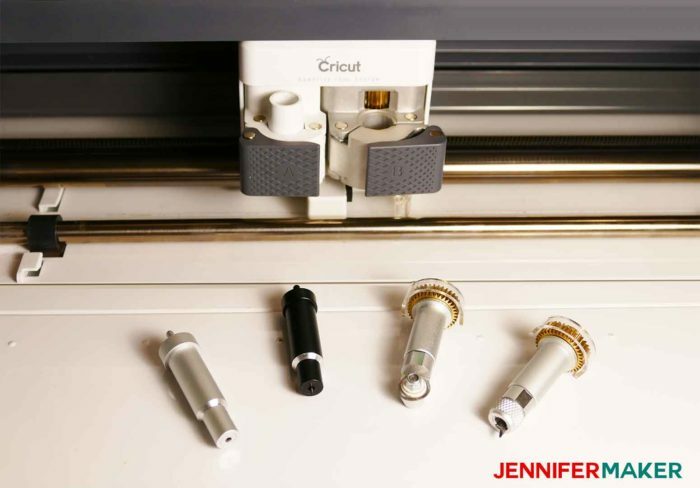 Click here for more tips on fixing Cricut cutting problems! I like to store my blades right in my Cricut compartments, inside the drop-down door in the front. The compartment on the left is designed for blade storage and works great. Put blade housings in the back on the raised plastic points. Loose blades go in the front — there’s a handy magnet there to keep them in place. The nice thing about keeping your blades here is they are always with your Cricut, even if you transport it somewhere else. That said, if you have a lot of blades, you’ll need a bigger place to store them. 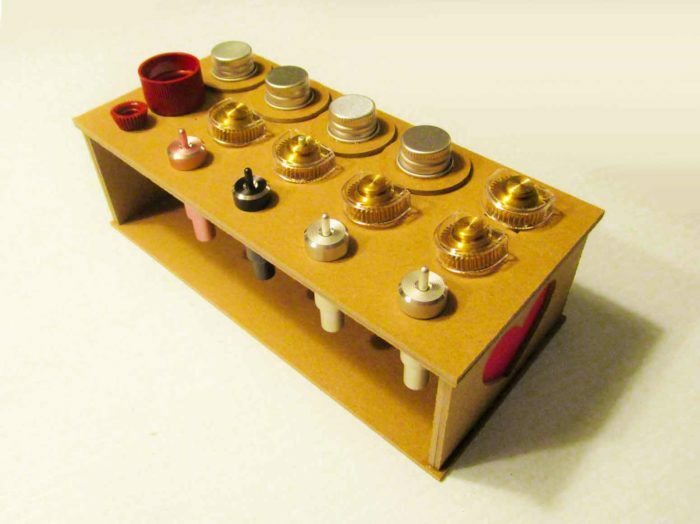 Here’s an awesome Blade Housing Organizer designed by Lisa Dye that you can make on your Cricut Maker using 2mm Cricut chipboard! Tip: You can store your loose blades in little glass vials from craft stores and keep them in this organizer, too! Do you have favorite Cricut blade tip or trick you’d like to share with everyone? Post it here! I always love to hear from you! I will keep adding to this list, too. And if you want to get more Cricut tips and tricks, check out this list of 45+ Cricut tips and tricks! 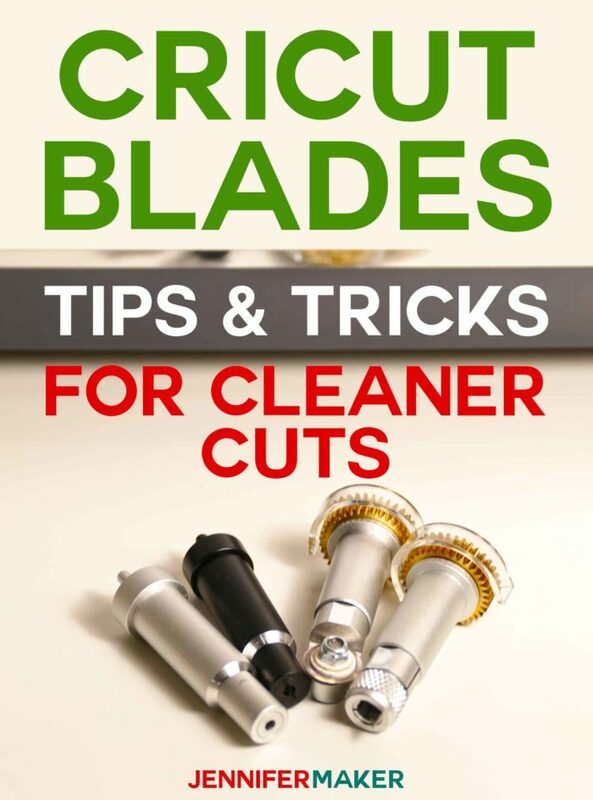 Want to remember this list of Cricut Blades tips and tricks? Pin it to your favorite Pinterest board! When you say to ‘mark’ your different blades, just be sure you don’t mark the actual blade. Jennifer is saying mark the COVER for the blades. Even a tiny bit of paint on the blade makes it NOT fit in the housing. Just thought I’d share my experience trying to identify mine. LOL Love all youro hints and projects. Thanks!! I cant get the link to work is it no longer available? 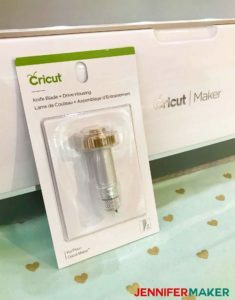 I fixed the links in this article — sometimes Cricut moves things around in their store. i retried the link even signed out of ds and signed back in and retried and will not work is there another way to get file and save to my computer and bring into ds?